In our today’s report we feature an idea which was already mentioned many times by other value investors. However, our outcome is different in one point which leads to a completely different picture. 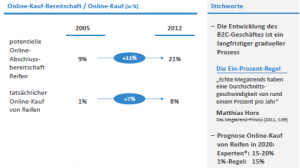 Here you can find the analysis of Profitlich&Schmidlin and from others (We have to add that these two funds share one platform). We would like to present you our 3 cents on Delticom. 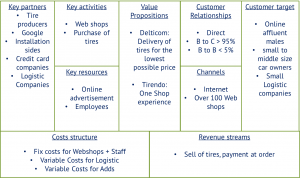 The online tire store Delticom was often proclaimed to be a value investment. Besides its growth rate that was because it used to have a solid balance sheet, an easily understandable business model, and because its extremely high returns on equity. The only issue was that it was relatively highly valued, which wasn’t actually that high if you trusted the growth forecaster the analysts, for a long time. (You can see the chart of Delticom’s stock price since 2007 under this paragraph.) 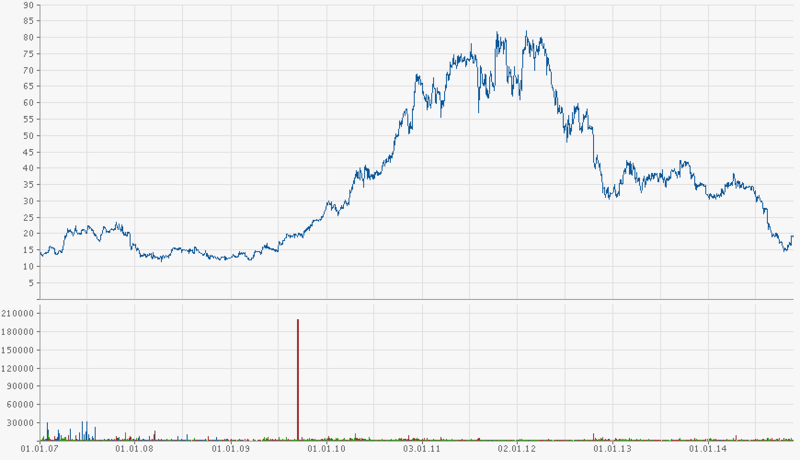 But then everything turned and the stock price tumbled down from its highs in the 80’s down to today’s level. At some point of this journey many value investors started to look at Delticom as a value investment which was down only for short-term reasons, many of them still think so. 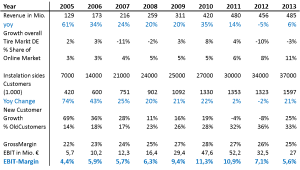 Today Delticom trades around prices which we have seen in the financial crises of 2009 and which are a quarter of the early 2012 prices. This as a couple of reasons, margins began to deter, Delticom acquired Tirendo (a loss making, blown balloon out of a VC-house like the kind of Rocket Internet is) and additionally the growth stopped. Recently the company reported their first loss since IPO. But why are so many value investors interested in Delticom that they buy up to 10% of the company? The answer is simple, all these issues will be only short-term and Delticom will be able to bring their EBIT-Margins back to a level of the early years. 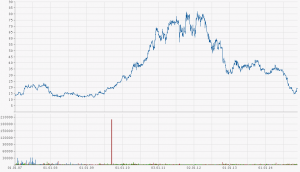 They assume that Delticom will be able to generate a sustainable EBIT Margin of over 7% or even more. In the Table below you can see the numbers of Delticom as a stand-alone. We don’t think so and we will explain you why in the hereafter. The basic business model of Delticom is selling tires through the internet. 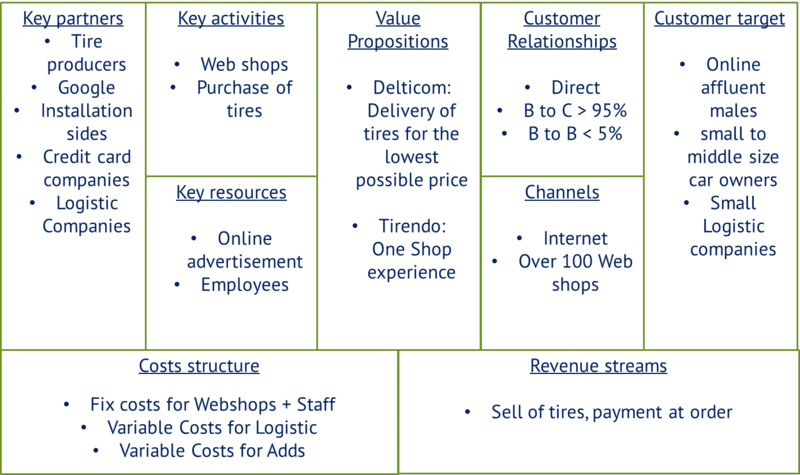 Below you can find a Business Model Canvas of Delticom which helps to break down the business and the key functions of Delticom further. Normally a potential customer searches for the best tire in a magazine or the web where they read some articles and tests. When the customer has found his perfect tire he will go either to his contractual car dealer which is the case especially for premium cars (round about 37% of all tires are installed by the original car dealer up from 29% in the year of 2007), a free garage or tire dealer (44%), a chain like A.T.U (10%) or he will buy the tires via the internet (8%). When he chooses to buy in the internet he will search for the product via his favorite search engine and search for the cheapest price for this special tire he would like to buy. This step in the buying process is crucial because he will then choose one of the shops which will appear first in the result list. To appear first in the results you have to spend a lot, you have to pay Google some money for the ads and you have to employ some IT guys who do the search engine optimization process. The costs should be around 4 Euro per every new customer which is around 2% of the overall revenue which one customer produce when he shops for 4 tires in a price range of 50 Euros each. For this reason Delticom runs over 140 online shops in Europe. When a customer found his online shop he can choose among a couple of garages in his region who are partners of Delticom, in total Delticom has over 40.000 partner garages where the customer gets his tires installed, the prices of every installment is observable on the website of Delticom. It is important to note that these garages are not exclusive partners of Delticom and can work for every other online shop they want. You have already seen that Tirendo actively acquired these garages for their own purpose. Quick recap: Delticom is a really asset light business which only runs the online store and the purchase of the tires, everything else is sourced out to third-party suppliers. The management seems to be really cost focused; for example I heard stories that the north america manager has run its business only with a smart phone. The main problem in the business model of Delticom is the cycle of sales to customers which usually tend to be between 4 to 8 years for tires, this led us to the fact that Delticom has to spend new money to acquire the customer again and again and will therefore leave a big part of its potential profits to Google. Delticom is showing numbers of old customers which have done repetitive purchases at one of their online platforms but I doubt it that this is based on customer loyalty, I think this is only based on the fact that one of their shop appears first in search engine results. This is probably why there are now trying to enter the business of spare parts. Therefore Delticom has no moat of repetitive behavior like you can observe it at Amazon. Another major obstacle is that Delticom cannot lock in the garages exclusively because they are even with 80% market share not in the position to dictate their terms. This leads to results like the growth of Tierendo which easily used the database of Delticom and acquired one garage after another in a record time. So there is no or not a big Moat in the number of partners which you need to compete. A future interesting point is that after a small field study of us, Delticom has its prices at the level of the bricks- and mortar competitors or only slightly below. Sometimes you can observe an increase of gross margins (Like in the year of 2010) because they increase the price of the tires when they run out of stock and use this as a form of yield management. Delticom seems not to use its purchase power to drive down prices aggressively, they normally use an approach of asking the suppliers for a price and then use a liner mark-up to all goods. This is not the strategy which successful retailers like Aldi or Lidl use which usually focus on a selection of suppliers and products which allow them to reach better purchasing conditions. This is an additional risk that when a new competitor steps up and use the strategy Delticom will suffer. 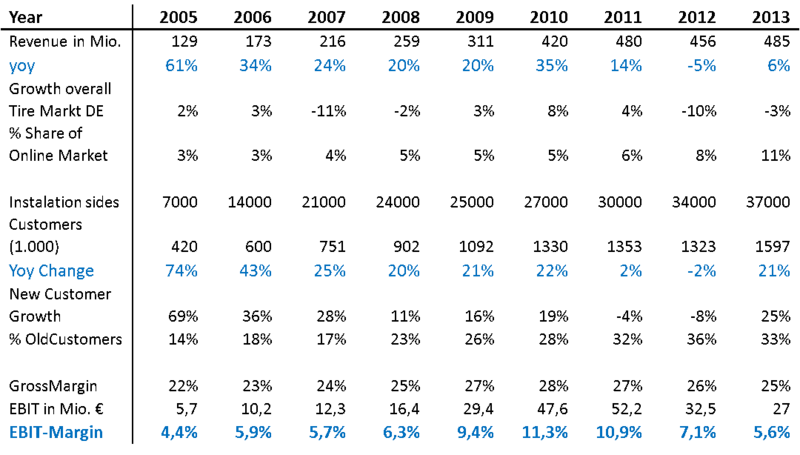 Other Value Investors tend to use the amount of positive customer reviews as an explanation for an existing moat, this is a point which I can follow but this is nothing which I would overvalue, when I buy a new Smartphone I search for the cheapest price and then I use the cheapest shop if it received more than 90% positive feedback. I don’t think that the role of feedback is a strong moat in the internet because you can buy it really quick and easily. The thing which matters the most is qualitative feedback and reviews of products which you can see for example on Amazon, because this is what you searching for. So let’s come to the second point on the agenda, the incredible strong growth performance of Delticom and the internet tire market in the last couple of years. In the last years the growth in the tire industry was mainly driven by the implementation of the new law which obligates you to use winter tires on your car from the year of 2010 onwards. Furthermore we had to deal with a really harsh winter in the year of 2010. So if we take these facts into account, we will not see the strong number of sales of winter tires in the future again. The overall market for summer tires has declined by around -2% since the year of 2000. 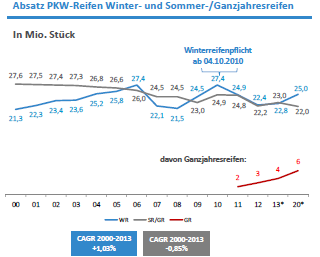 This in combination with an overall shrinking population of Germany, longer usages of cars, increase in the capabilities of tires in terms of kilometers, lower car usage due to a substitution through public transport lead us to the conclusion that the overall tire consumption will modestly decrease. According to the big tire producers Michelin, Continental and Pirelli the unit volume in the replacement market will stay constant in Europe in the near future. This is in line with the long-term trend of stagnation in Europe. 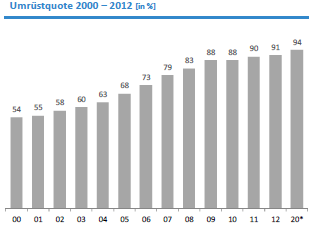 Therefore Delticom has to increase its market share in an overall saturated market to continue to grow further. Since the year of 2003 Delticom has led the online tire market to one success after another, the total share of the online market has increased from nearly 0% to over 8% in at the end of the year 2012. 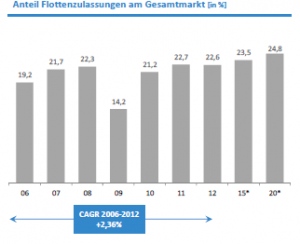 Delticom already owns around 80% of the overall tire market according to the ADAC. So the question is: can Delticom show the same growth in the future? I think as always things getting harder, for example we think that the proportion of fleet cars is really important for the future growth because these cars will never see tires which are bought via the internet. At the moment the proportion of fleet cars is around 22% and will probably increase to 25% in the year of 2022. Furthermore we can observe that the proportion of dealers which sell cars and do the routine checks of these cars push stronger and stronger into the market of tires. The proportion of installed tires which are done by car dealers is now at 37% which is much more than the 29% of the year 2007. We think this number will increase further because it’s a logical thing for every premium car (the big proportion of the owners will not search for the cheapest tire in the internet) dealer to increase the interaction and stickiness with his client. 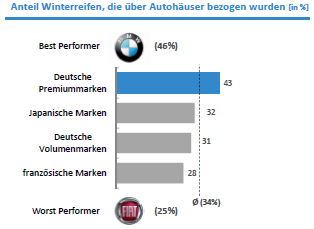 For example 46% of all BMW clients buy their tires from the car dealer and let them store there. Also the big chains will at least stay at their level of sales which is now around 10%. Therefore we think that the online market will increase its market share to around 15% which is in line with the BBE-study which we used. 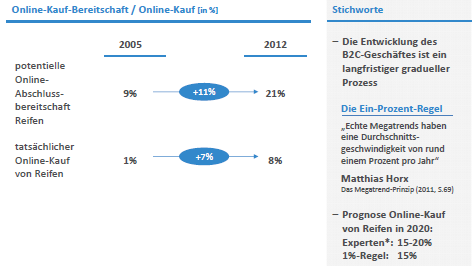 For our valuation we will use a overall market share of the online market of 15 to 22%. These points are all things which will foster further attacks by new competitors and therefore speak not for a sustainable moat and not to high EBIT Margins. In the next post we will share our valuation of Delticom and why the business model which is built for high ROCE and high ROIC is not build for last. For this reason we will go deeper into detail about point 3 and explain it in more detail. Furthermore we will explain why Delticom was able to growth so strongly without additional capital over the last 9 years. Thanks to a reader I was able to correct a mistake, Tirendo was not from Rocket Internet, it was founded by another VC house. I’m sorry for this mistake! sehr gute Info über Delticom. Vielleicht könnt Ihr folgende Info noch in Eure Analyse mit einfliessen lassen, was meiner Meinung nach den zukünftigen Reifenmarkt zum Nachteil von delticom verändern wird. Ich denke, es ist nur ein kleiner Schritt der Reifenhersteller, aber es könnte den Reifenmarkt (ähnlich dem Konsolen-Spielemarkt (PS4, EA-Spiele downlaod anstatt über Handelskanal)) inZukunft. komplett verändern. vielen Dank für die wie immer guten Infos, ist auf jeden Fall ein weiterer Baustein im Puzzle! Ich hoffe nur das ich bald die Zeit finde den zweiten Teil fertig zu schrieben. 1) tyre24 ist eine B2B-Plattform, insoweit ist es für Delticoms Geschäftstätigkeit irrelevant, wenn dort Hersteller wie Nokian ihre Reifen anbieten. 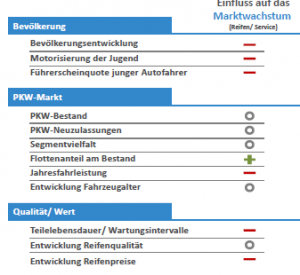 2) Zweistellige EBIT-Margen wird Delticom auf absehbare Zeit sicherlich nicht mehr erwirtschaften. Ein wichtiger Punkt, der dem Geschäftsmodell jedoch künftig ein Allleinstellungsmerkmal sichern und die Geschäftsentwicklung deutlich beflügeln sollte, wurde in Ihren Ausführungen nicht erwähnt: Der “mobile Reifenservice”, den das Unternehmen gerade einführt. 3) Nach den bisherigen Erfahrungen ist es unwahrscheinlich, dass ein Dritter noch einmal versuchen wird, einen Online-Händler wie Tirendo in Position zu bringen. Delticom würde das nächste Mal mit einer anderen Strategie reagieren und kein ernsthafter Investor wird bereit sein, mit einer Tirendo 2.0-Version viel Geld zu verbrennen. auch Ihnen vielen Dank für Ihre Anmerkungen, ich werde sie in meinem zweiten Teil der Analyse berücksichtigen. Generell kann ich nur sagen, dass Unternehmensbewertung eher eine Kunst ist und da gibt es bekanntlich verschiedene Geschmäcker. Wir suchen nach hervorragenden Geschäftsmodellen, hervorragenden, vertrauenswürdigen Managementteams und einen preiswerten Einstiegszeitpunkt. Bei Delticom sehen wir die ersten zwei Punkte nicht gegeben. Enter your email address to subscribe to this blog and receive all new posts by email, as over 200 other followers do.